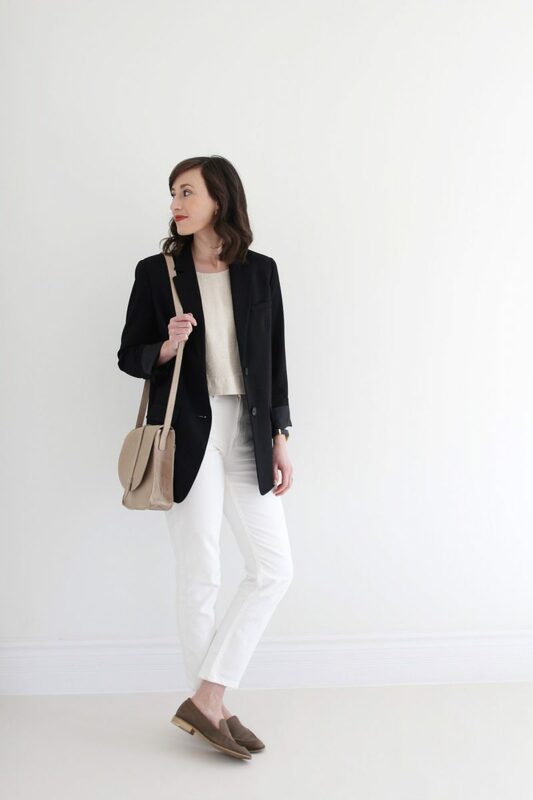 White denim is a spring and summer staple in my closet. I always find that it adds some freshness and levity to my style, which is a nice change after a winter spent in mostly dark colours. 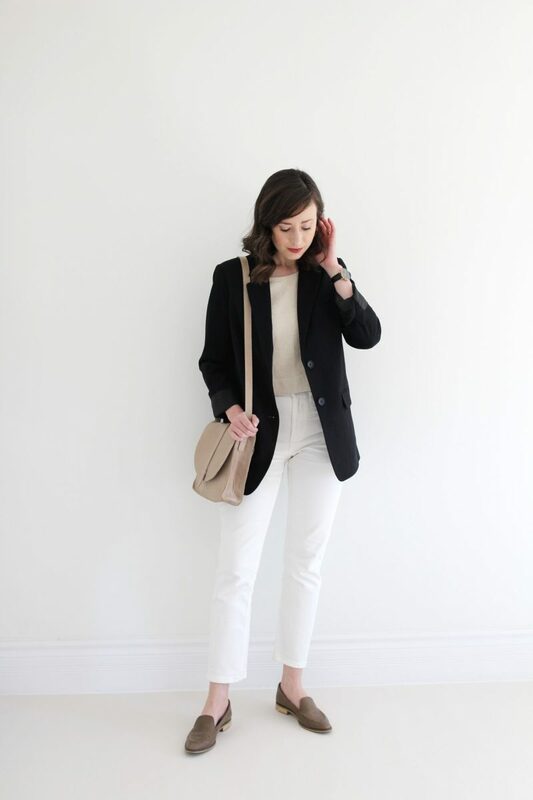 I often see white jeans paired with overtly feminine pieces like floaty tops and high heels, however, I think they work just as well with basics and menswear inspired styles like utility jackets and loafers. 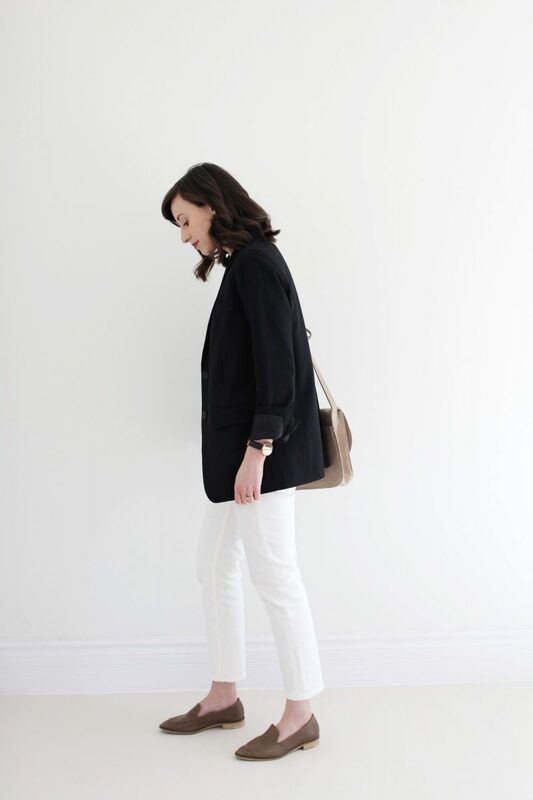 With that in mind, today’s post covers two ways I’m styling white denim for the spring. Both looks were inspired by some recent Pinterest perusing and while they’re quite minimal, some thoughtful details steer them away from being boring. At least in my opinion! 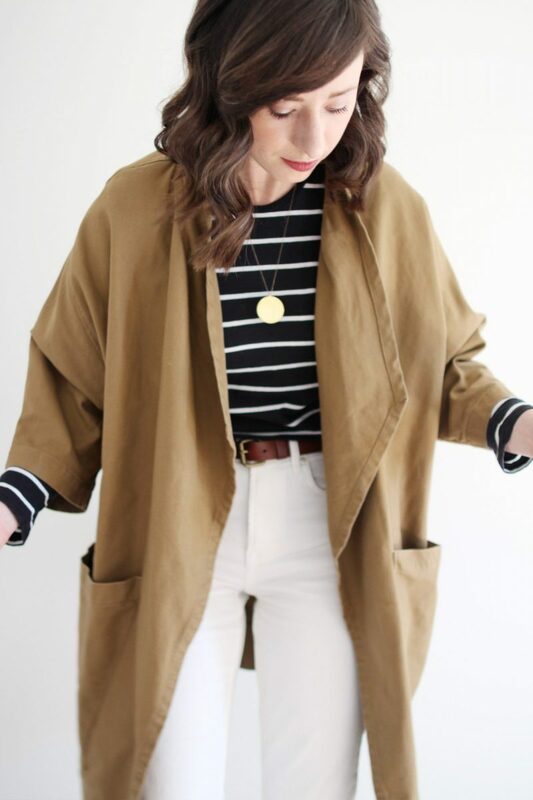 In addition to my two approaches, I’ve assembled 6 other white denim styling ideas that might spark an outfit for you! Those are towards the end of the post, along with a round-up of denim options worth checking out if you’re in the market. Now shall we explore? 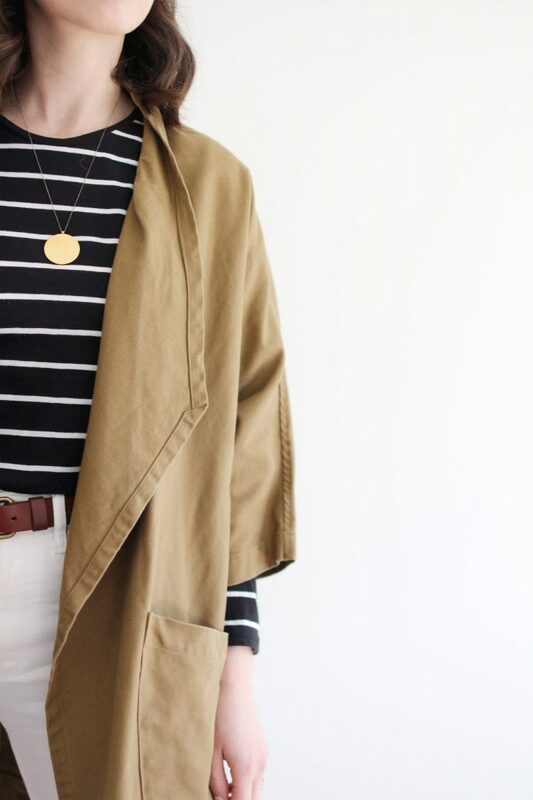 A CROPPED JACKET SLEEVE LETS THE BASE LAYER PEEK OUT. STRIPES DRAW THE EYE UPWARD, BALANCING OUT A WHITE BASE. A FITTED BASE PAIRS EASILY WITH AN OVERSIZE OUTER LAYER. A LARGE CIRCLE PENDANT CREATES AN INSTANT FOCAL-POINT. My first outfit idea was inspired in part by this look, which I found on Pinterest. 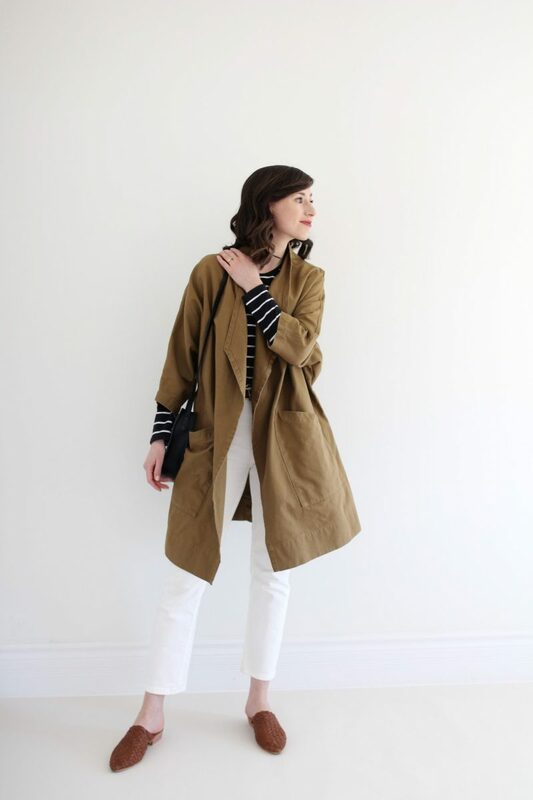 I love how the utility coat contrasts with the white jeans and how the the brown accessories come into play. I skipped the white shirt and bucket bag for a striped tee and an old favourite leather cross-body. 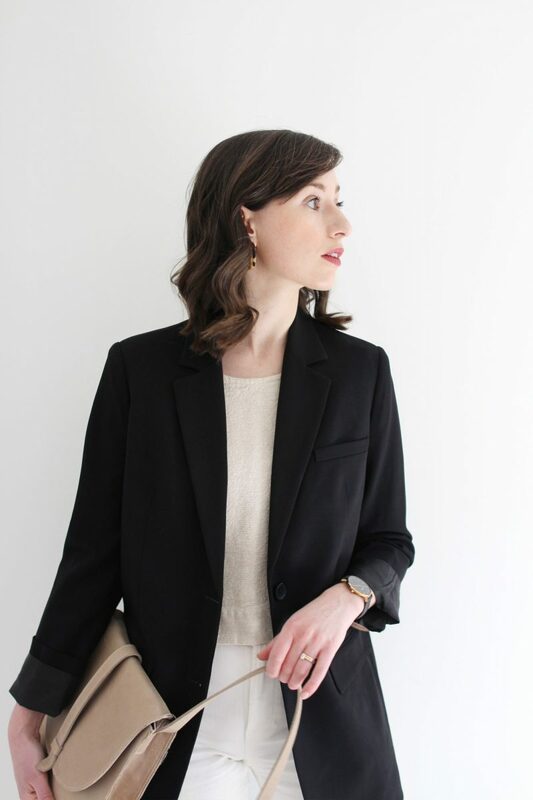 My take might have less sartorial street-style appeal but it’s great for a cool spring day of café work sessions, meetings downtown or running some errands. I’m loving this colour palette of muted olive and burnt cinnamon brown with black and white. It feels earthy and cozy but lots of white keeps it fresh. 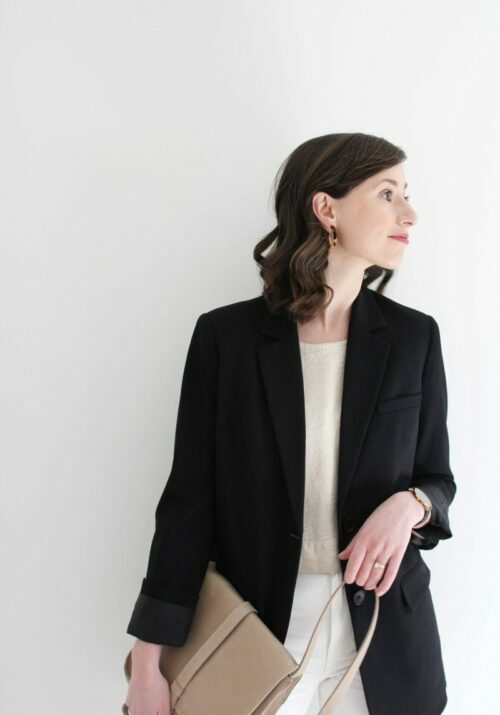 HARPER JACKET | ELIZABETH SUZANN | $265 USD | Made in Nashville, TN | I wear an OS Minus | See my review here. STRIPE TEE | EVERLANE | $25 USD | Made in Vietnam | I wear a small. PARIS MULE IN VINTAGE TAN | ST. AGNI | $229 USD | Made in Indonesia | I bought a 37 in this pair as the vintage tan leather is softer than the almond and felt less narrow. See my review here. BAG | old THE STOWE | *Linked to similar round leather option. BELT | ATELIER B | $44 CAD | Made in Montreal, QC. 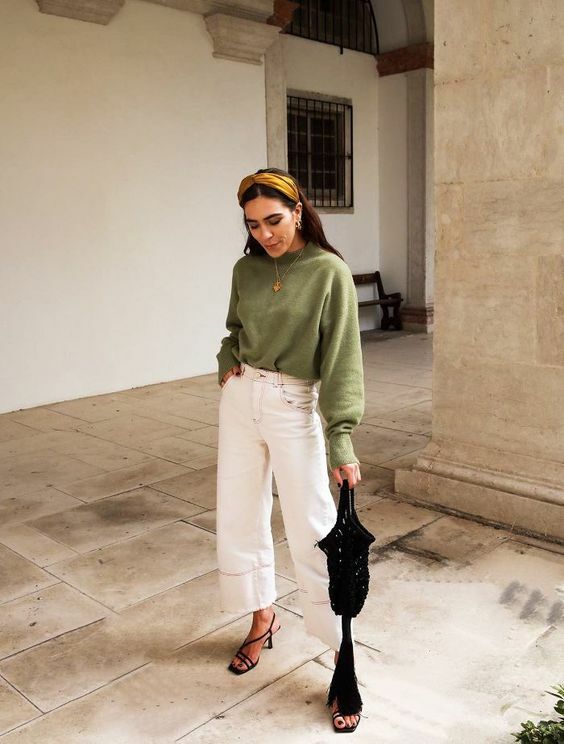 A WIDE HEM CROP TOP OVERLAPS A HIGH RISE WAIST, NO TUCK NEEDED. A SOFT WAVE IN THE HAIR WITH A NEUTRAL STATEMENT HOOP ADDS TEXTURE & FUN. A WRIST WATCH ADDS A TOUCH OF PROFESSIONALISM. A STRAIGHT LEG FLARES OUT JUST A BIT FOR AN ELEGANT FINISH. I took notes from this look to create outfit number two. I wanted to make this one a bit more professional so I added my modern loafers (fun fact: they’re the first shoes I ever bought from Everlane! 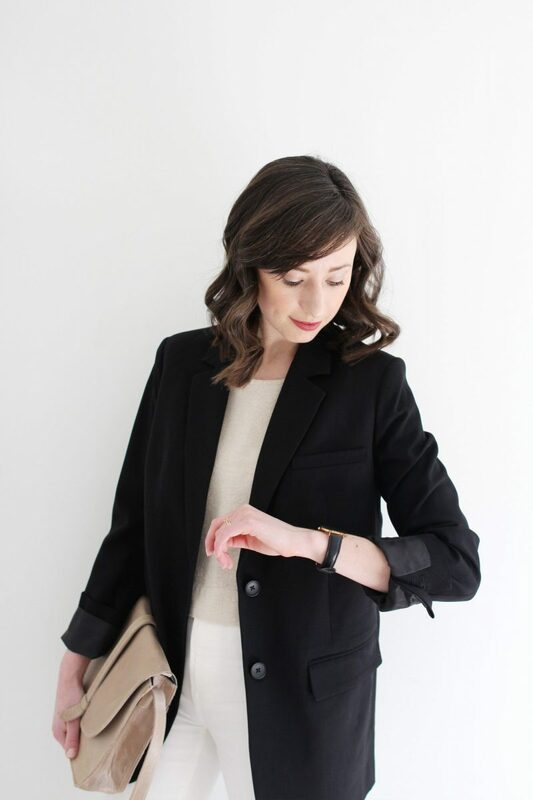 ), a cross-body bag and a watch to add some refinement. At the same time I really liked how the woven bag in the original outfit added texture and softened things up so I pulled out my flax/linen crop tank for a similar effect. I was really happy with how everything came together for an understated but elegant outfit. 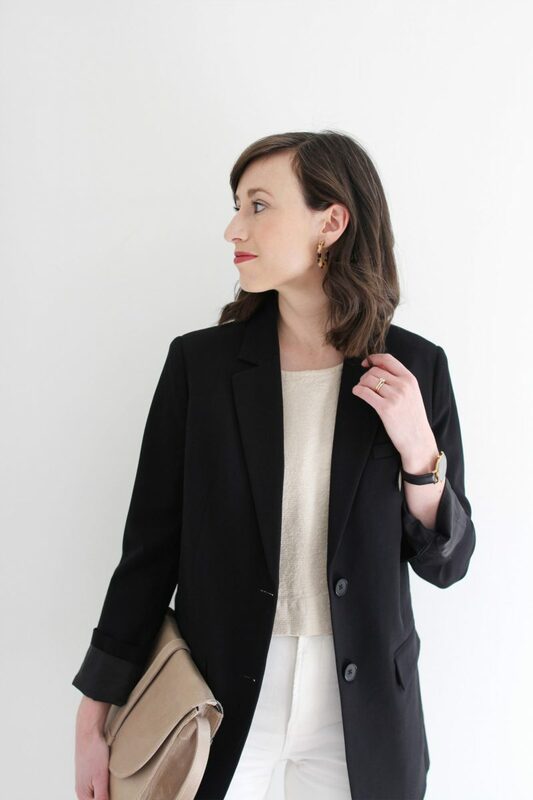 It’s always interesting to see how seemingly incompatible styles like a flax Petra Crop tank and a black blazer can pair so well. This one would be great for all the same activities as the first look but feels a bit more sophisticated and structured if that’s your preference. PETRA CROP | gifted ELIZABETH SUZANN | This piece is no longer available but there is a similar option available here. MODERN LOAFER | EVERLANE | $168 USD | Made in Italy | More colours available. 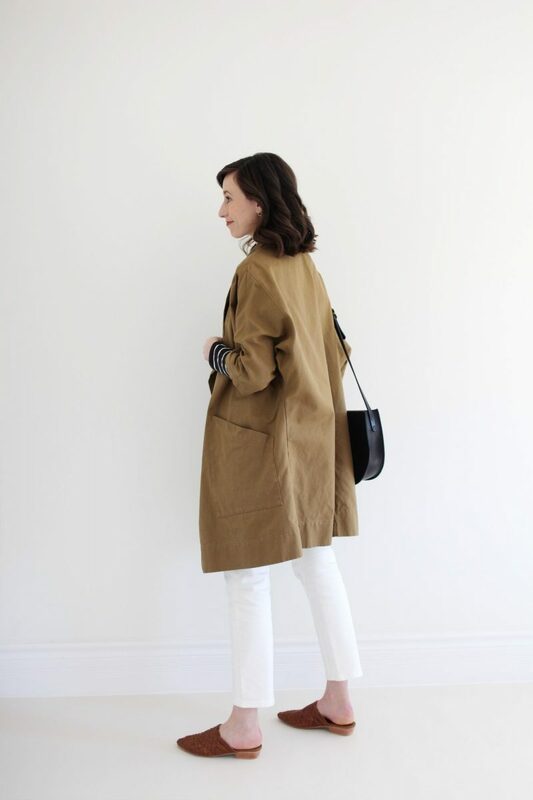 | I wear a size 7 in all Everlane footwear. LIP COLOUR UNDONE | KOSÅS | $28 USD | See my review of these lipsticks here. 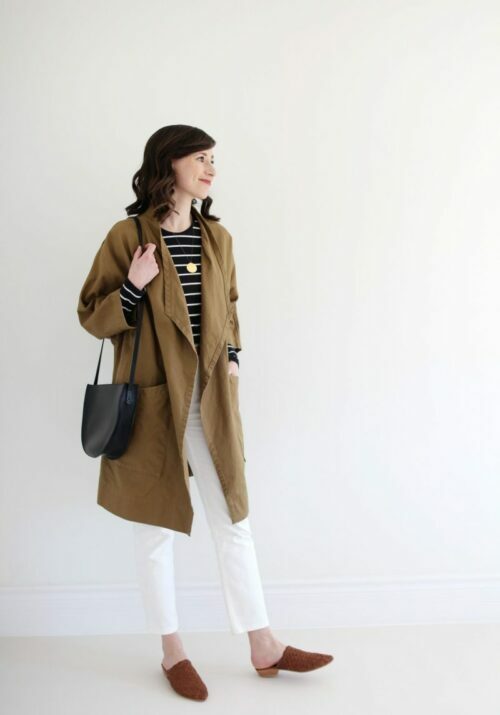 In both looks above I’m wearing the Cheeky Straight Jean in Bone from Everlane. I bought these jeans last year and really like the fit (frame skimming but not tight), softness (I can wear them all day) and opacity (there is no show through, even with a black top tucked in). They’re super comfy, relax a bit with wear and wash up well every time. 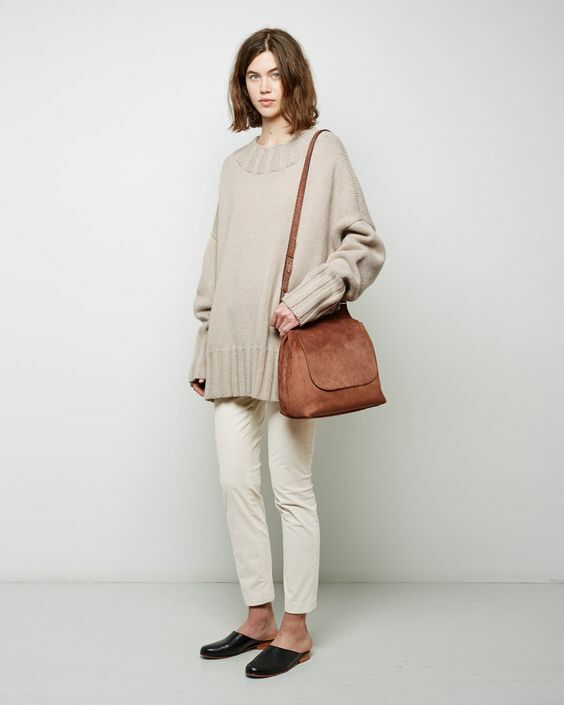 I’m typically between a 26/27 in Everlane denim and wear a size 26 in this style. Valid today through April 11th on Everlane orders over $100 USD. Please feel free to ask me any additional questions you might have about these in the comments. THERE YOU HAVE MY WHITE DENIM IDEAS FOR EARLY SPRING! GOT A FAVOURITE? 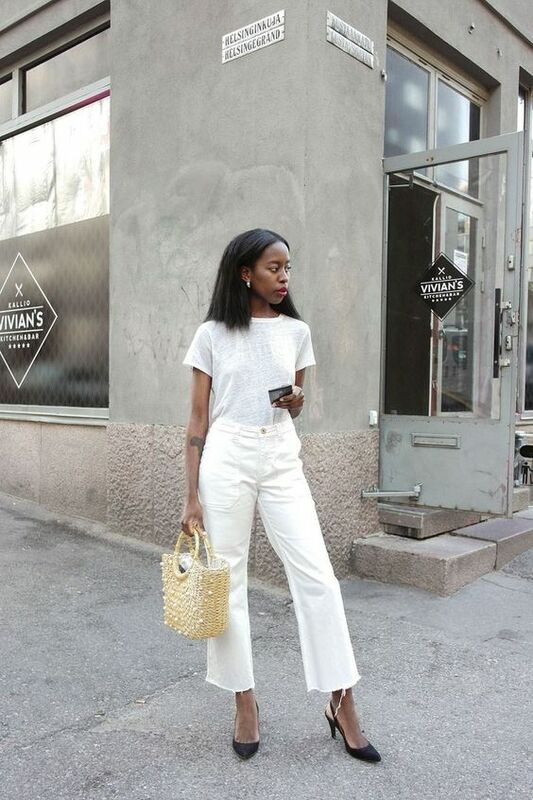 HOW DO YOU STYLE WHITE DENIM IN YOUR CLOSET? THANKS FOR TUNING IN & HAVE A WONDERFUL WEEK! I love that you chose white jeans for this post. I just bought my first pair a couple of weeks ago and have been looking for ideas of how to wear them. I love them with the trench coat on the first outfit! 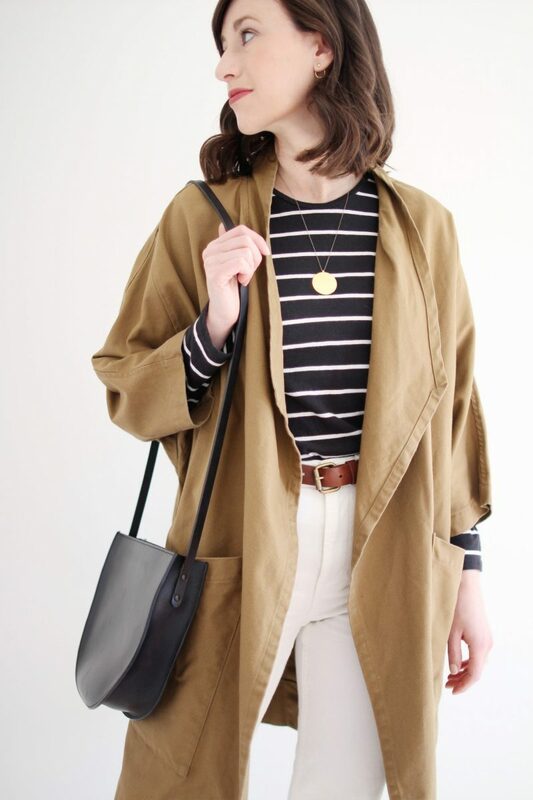 Just like other readers I love this jacket and am sewing up a Wiksten Haori (long version) to achieve something similar but in a cafe-au-lait linen. However, I won’t be going sockless here in Kingston, ON for a while. When I went out to get a head start on my spring garden clean-up yesterday, there were still ice crystals lingering in the soil! 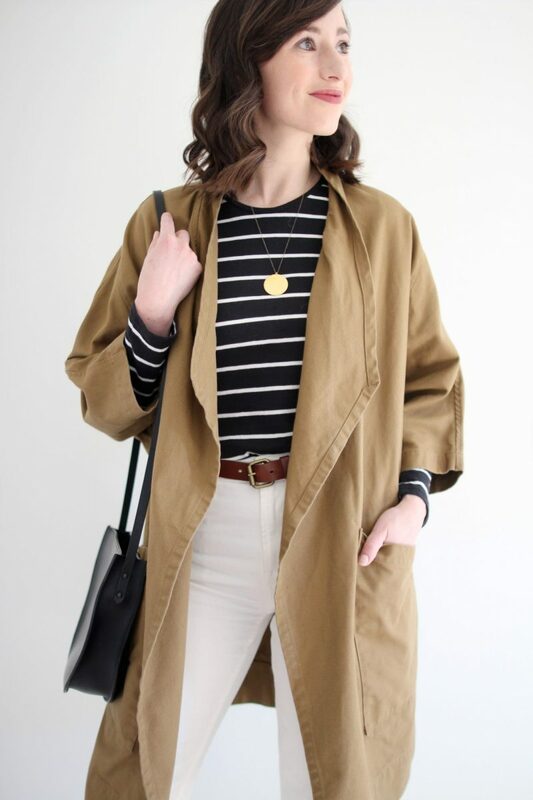 That’s so cool you’re sewing your own trench Elizabeth, good for you! Double digits have arrived here today so we’re hoping the warm rain will soften up the earth for our garden too. Have a great weekend! Hey Lee, love the outfit inspiration for spring! The weather is finally turning here in Seattle and I’m excited to start wearing some brighter colors. A quick question – knowing that you have two fur babies, how do you keep pet hair off your black wool items (like the blazer)? I always find that the pet hair weaves itself into the fabric and is almost impossible to keep completely clean. Thanks! Such a cool post! I love finally swapping out my dark wash jeans for white denim 🙂 Also your graphics are super cool, but a lot of them cover the shoes in the picture! I love the first look and how you balanced the white in the denim with the striped tee! Genius! And I really like the large pendant necklace in that look. I would have never thought of pairing a striped tee with a necklace like that, but it looks fantastic. I love both your looks but the second one really speaks to me! I was wearing my white jeans today with a white w/black stripe T. Yours look some much better with the black w/white stripes. How such a little thing can make a big difference. 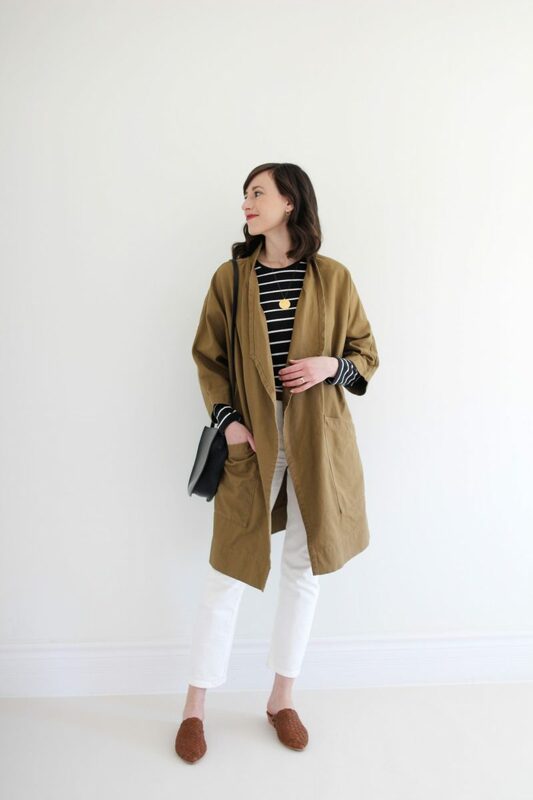 Time for another Everlane spring order! I’ll be sure to purchase through your link. 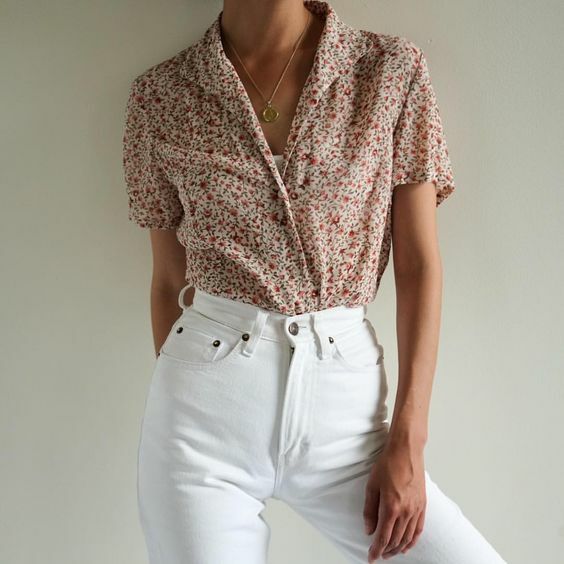 By the way, Everlane’s white jeans are a little bit heavy weight for Florida – would you know of a lighter weight denim perhaps? 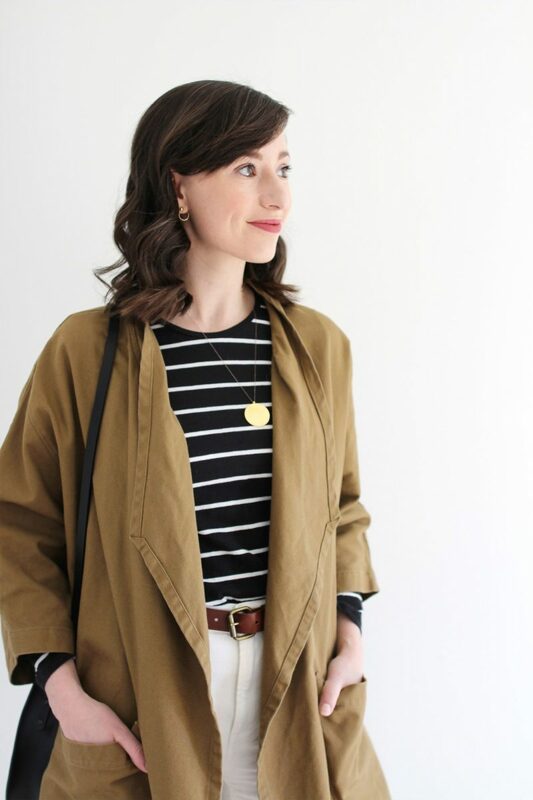 Thanks for all your posts – my wardrobe and closet are finally starting to make sense! 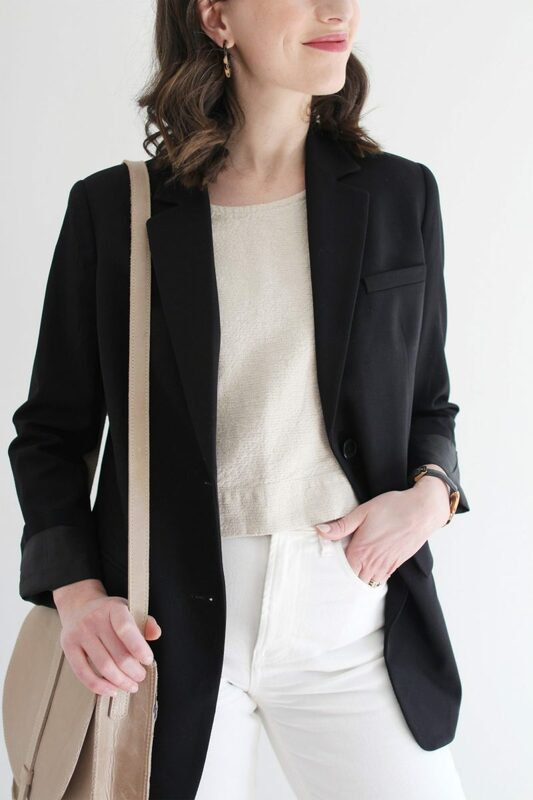 Great inspiration, I love the mix of linen with the sophisticated look of outfit n°2 ! I have been wearing my white pants with an olive top (I called it my peter pan look :D) and with a stripe tee but I hope they’ll get more use as the temperature warms up. 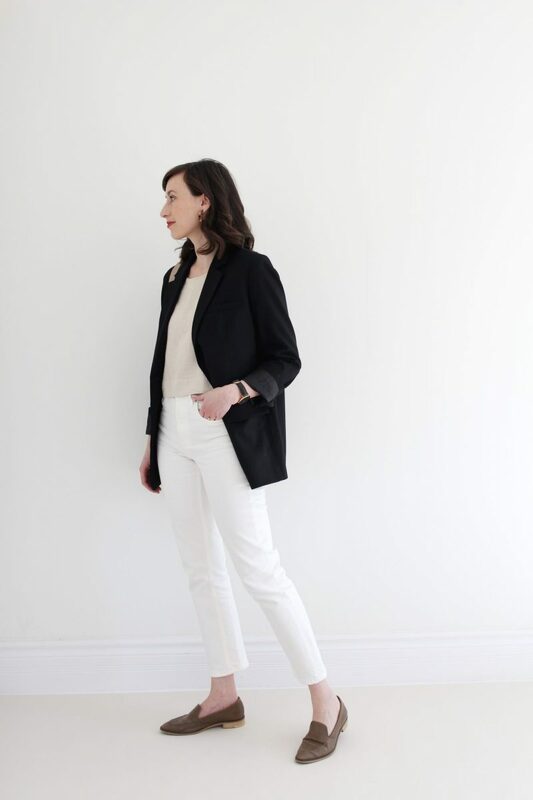 Personally I can only do white pants in summer – it’s a matter of practicality; it’s just too wet in Toronto spring to pull them off and I’ve gotten splashed by buses or cars whilst biking or walking, which is a day (and outfit) ruiner! But this summer I plan to rock my “bone” Everlane straight leg crops for sure. P.S. Every single time you post the Harper jacket I get *this close* to ordering it. I think I just have to bite the bullet and order it already! It’s so good! Ah, I hear you on the spring biking! White pants are definitely a dry-day-only item. So funny you mentioned buses splashing you, I remember getting completely drenched by a bus one time and it was traumatizing! haha Now I’m always subconsciously aware of nearby puddles. I was so pleased to see this post this morning. I just purchased a pair of Everlane straight denim in Bone. (My first try at that brand.) I was looking through your outfits for inspiration on styling them. I actually have them on with a black tee, taupe blazer, black flats and black belt that was inspired by an outfit I saw on your Pinterest board. I have a little time before leaving for work, so I thought I would check your blog. I will definitely be trying these 2 outfits from my closet. Thank you for the inspiration!